Enjoy a fast and friendly meal from the original home of the Whopper for less. When you purchase a discounted Burger King gift card from Cards2Cash, you save on breakfast, lunch, and dinner. With thousands of locations across the United States, eating out at an affordable price is also unbelievably convenient. At Burger King, quality and freshness are at the heart of everything they do. Looking for a filling breakfast that will help you get through the day? Start your day with a Fully Loaded Croissan’wich and a Smooth Roast Coffee. A toasted croissant filled with thinly sliced sweet Black Forest ham, scrambled eggs and melted American cheese, the Croissan’wich is irresistibly flaky and delicious. And add an order of hash browns to make a complete morning meal. 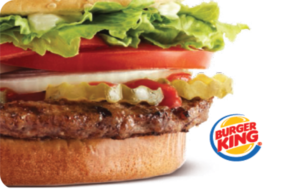 At lunch, Burger King prides itself on the flame-grilled, freshly prepared tradition that goes into every order. Enjoy a Whopper with your favorite toppings or try something different like the savory and flavorful Chili Cheese Grilled Dog. And make it meal when you add thick cut french fries or golden onion rings and a fountain drink. You don’t need to pinch pennies anymore because with a discounted Burger King gift card from Cards2Cash, it’s like everything you buy is on sale. And for a quick and easy dinner, lighten things up with a juicy Tendergrill Chicken Sandwich. As with everything Burger King serves, you can “have it your way” for the perfectly personalized dinner on the go. No matter what time of day, BK invites you to experience good food, fast. Taking your family (or co-workers) out for a meal has never been easier or more affordable. Let yourself be King for a day with a discounted Burger King gift card from Cards2Cash. Looking to Sell Your Burger King Gift Card? Do you have a Burger King gift card you aren’t going to use? Cards2Cash buys gift cards for many national retailers and websites! Turn that unwanted gift card into money in your pocket! We pay the highest possible price for unwanted gift cards! If interested, visit one of our retail locations, for immediate payment OR fill out our online form, and we’ll get back to you with an offer you won’t want to refuse. Cards2Cash is your one-stop, gift card shop!